I am still trying to get caught up on a lot of projects that seem to have been on my TO DO list for too long! A few years back DH had to go on a business trip to Tokyo. as it was getting close to when DS would no longer qualify as a “kid” we decided he would accompany him. We also arranged for have my in-laws fly over and sent a ticket so they could bring DSs best friend from the US with them. They accompanied the boys around while DH was in his meetings and then they all did a few touristy things for the rest of the time. My MIL took a load of good photos (but oddly, 98% were landscape, which made for some interesting design choices) and I have been meaning to do something special with them for AGES. Well, getting those handy kraft folders gave me a great idea. Another couple of bits from Staples (like the ACCO fasteners and the plain kraft guide cards) and a bit of luck (compliments of Amy at Willow Tree Crafts – a bunch of the just bigger than 12×12 sheets of cardboard that come in every paper pack to keep the papers flat and nice) and I had almost all of my supplies. I had a collection pack of Basic Grey BOXER (OK, OK, so BOXER = China and these are Tokyo=Japan, but the papers were the perfect colours and still oriental enough to work so I decided to throw cultural correctness out the window and use them anyway) and used make this 12×12 folder for all the photos. 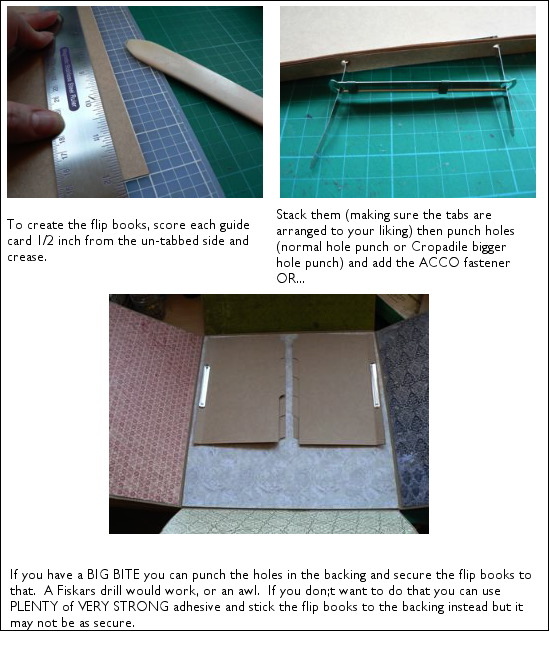 The plan is to use the same trick as with the folded mini-book from last week, and add lined or gridded paper to the back of all the flip-book pages. I thought it would be a fun thing for DS and the in-Laws to fill in recollections of the photos together, in their own words and own writing, rather than me doing my usual computer journaling. 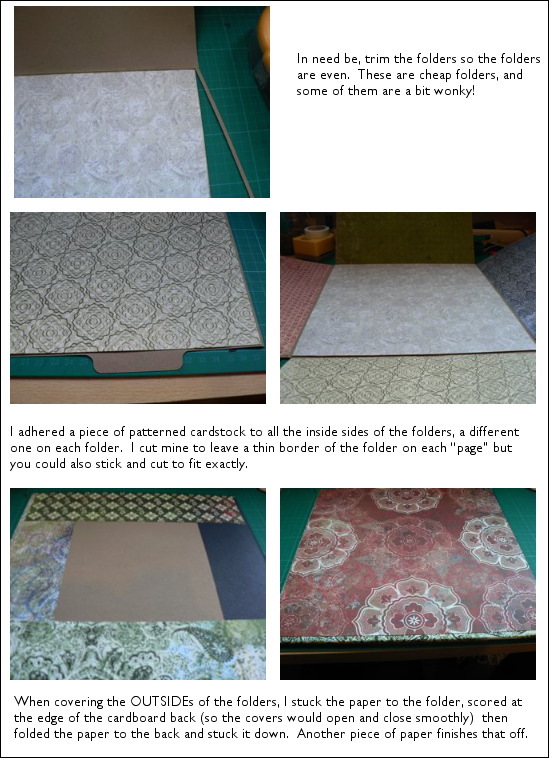 These are the basics for making the folder – I’ve not decorated it or added the photos yet, but that will hopefully get shown here at some point! Oh, and that really should be 10 (TEN) sheets of Boxer paper, not 8! Hope that makes sense but if not pop a comment on and I’ll try to help. 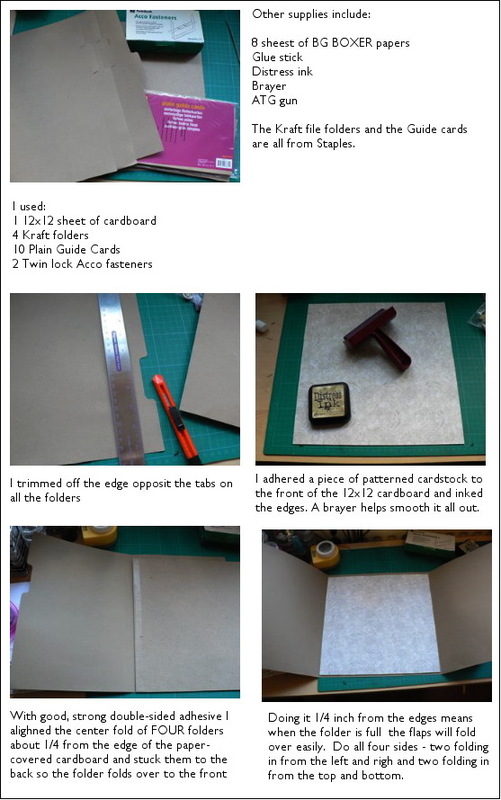 I don’t see any reason why you couldn’t so this with manila folders, or any other style folders, you just need to use the basic idea and have a play – and let me see what you do! Categories: mini-albums, scrap related | Tags: Basic Grey, folders, Tokyo | Permalink.